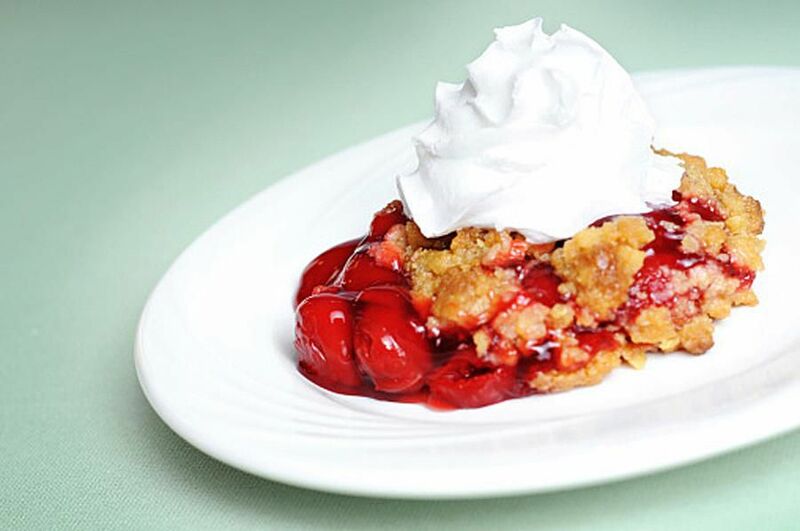 Enjoy this recipe for Upside-Down Cherry Cobbler. There is a canned cherries or cherry pie filling option in the recipe. Of course, you could use fresh cherries too, but you would have to slightly cook the cherries and the sugar to soften them up. Upside Down Cobblers are not like upside down cakes which are turned and dumped upside down after baking. For this recipe, the topping ingredients are placed on the bottom of the baking pan first. Then, the fruit is put on the top of the batter. When Upside Down Cobblers bake, the topping magically floats to the top of the fruit. In a medium bowl with a wire whisk, stir together the flour, 1/2 cup sugar, baking powder, and salt. Stir in 2 teaspoons melted butter and milk. Combine completely. Pour batter into prepared pan. Drain the canned cherries reserving juice. Add the cherries to bowl. Stir in sugar. Heat, not to boiling, add the cherry juice either using microwave or stove. Mix the hot juice and 1 teaspoon butter with the cherry mixture. Pour the mixture over batter in a pan. Bake it for 40 to 45 minutes. The cobbler crust will rise up through the cherry mixture. Serve the cobbler with whipped or ice cream. Refrigerate any leftovers. Replace canned cherries and 1 cup sugar with​ a 21-ounce can of cherry or other fruit pie filling. This dessert freezes beautifully. You could double this cobbler recipe, and freeze half. Bake them in separate metal baking pans. Allow one to cool, wrap it tightly and freeze it. Bake wrapped frozen cobbler for one hour at 350 degrees F. For the last 15 minutes, uncover the cobbler to crisp up the topping.